The trend toward abolishing the death penalty continues, despite some countries resuming executions in 2012, Amnesty International says. Executions in India, Japan, Pakistan, and Gambia were disappointing regressions, Amnesty notes. 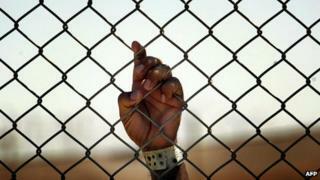 But elsewhere the death penalty was "becoming a thing of the past," secretary-general Salil Shetty said. The five countries carrying out most executions remain China, Iran, Iraq, Saudi Arabia, and the US. Amnesty International highlights an "alarming" rise in the use of the death penalty in Iraq - with almost double the number of executions last year compared to 2011, up from 68 to at least 129. Of the others in the five countries in the highest number of executions, the rights group logged at least 314 executions in Iran in 2012, and at least 79 in Saudi Arabia. The US carried out 43 executions - the same number as in 2011, but in fewer states. However, no precise statistics can be given for China, where numbers are secret, but where the group says it believes thousands were executed - more than the rest of the world put together. The report found that there was progress towards abolishing the death penalty in all regions of the world, despite a number of countries resuming executions after periods of not carrying them out. India carried out its first execution since 2004, of the only surviving gunman from the 2008 Mumbai attack. Indonesia - where a British woman, Lindsay Sandiford, is facing a death sentence for drug trafficking - has also just carried out its first execution in more than four years. This was not included in Amnesty International's latest report but it covers last year. Overall, there were just two more known executions last year - 682 in all - compared to 2011. And there were fewer newly-imposed death sentences - 1,722 against 1,923 - in fewer countries - 58 against 63. Also, despite the resumptions of executions in some countries, overall the number of states where they were recorded last year was the same - 21 - as in 2011. And Amnesty International points out that this is down significantly from 28 a decade ago. It said Latvia last year became the 97th country to abolish capital punishment for all crimes. Last year, according to the report, methods of execution included hanging, beheading, firing squad, and lethal injection.